During this era of transience, migration and social technological transformation, the art of Do Ho Suh’s focusing on the importance of home is noteworthy. Born in Korea in 1962, he came to the United States in 1991 to continue his studies at the Rhode Island School of Design and Yale University. He is a highly accomplished artist who spends time between several cities—New York, Seoul and London. Britain currently is his place of residence even though he continues to travel internationally. He feels his art is inspired by his transient existence and his entrenched memory of homes. Suh has become known for his architectural installations that challenge orthodox notions of scale and site-specificity. In his immersive, large-scale fabrications he investigates the meaning of home and architecture as defining a physical and psychological space that human beings both experience and inhabit. They are intended to be junctions of space, time, and memory linking multiple intimate places where he has lived. 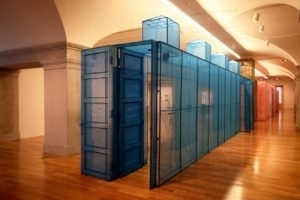 In Suh’s current exhibition at the Smithsonian American Art Museum titled, Do Ho Suh: Almost Home one encounters a luminescent, colorful translucent structure resembling a long corridor that he refers to as “Hub” sculpture. This self-contained translucent organza-like passageway is the focal point of the SAAM show. Suh deliberately works with this ghostly fabric, a variety once used in traditional Korean summer wear, “because it was cheap and readily available—“I didn’t want to give too much value to the fabric itself”. On the surface his work resembles minimalist sculpture, appearing very simple, however they are not, either in execution or intention. Suh mixes old-style Korean sewing methods with new technologies for modeling and mapping space to construct his memory sites and objects. To a degree this method aligns Suh’s art closer to the craft tradition. Do Ho Suh’s show at SAAM could have been appropriate for the Renwick Gallery’s Wonder exhibition last year. Although this artist’s work is devoid of personal details, it nevertheless evokes a sensibility of spaces and forms experienced in dreams. Ranging in color from red and pink (New York) to green (Berlin) to blue (Seoul), the fragile sheets resemble transparent, life-size walls embroidered with habitation notices and supposedly operable fire doors that read as chromatic solids. Visitors are encouraged to enter this haunting installation to scrutinize the enigmatic space however, only a few are allowed to enter the narrow passageway for a short time. Suh’s constructions in previous locations have manifested a more commanding presence because of the height and width of those gallery settings. Regrettably Suh’s first “Hub” created on the East Coast, is constrained by the granite columns and architectural restrictions of the Gallery area of the former Patent Office Building. Dealing with the site-specificity of this location, Do Ho Suh had to construct a tightly linear Hub along the spine of the gallery. Although this piece evinces some of the ethereal magic found in previous constructions nevertheless this space imposes severe limitations that does not allow for powerful grandeur. The most striking section of the installation is the bright red stairs inspired by Suh’s “348 West 22nd Street, Apartment A, Unit 2” where he lived from 2011–2015. The flight of steps is both inviting yet disconcerting, resembling a passage to nowhere. What are most enchanting in this exhibition are the remarkable handcrafted facsimiles of domestic objects that Suh refers to as Specimens. Hanging on the walls of the side vaults throughout the gallery one discovers ghost-like details from the apartments where Suh once lived. Each of the semi-transparent intricately detaile d, fabric replicas of household objects is exquisitely hand-stitched. An array of household objects on display includes a circuit breaker box, doorknobs, hardware, thermostats, a fire extinguisher ..., and radiator. These are so convincingly constructed that a viewer could easily imagine grasping one of the doorknobs or opening the door of washing machine. The selection of fanciful drawings adds to the exhibition. However, if a visitor didn’t possess sufficient history about this artist’s background and his views about home and memory, they could miss the artist’s intention and certain aspects of the show’s meaning. Elaine A. King, Contributing Art Critics who lives in Bethesda, Maryland. She is the former Professor, History of Art, Museum Studies and Art Criticism at Carnegie Mellon University.